It stands to reason that keeping your mind on task and eyes on task is vital – whether one is repairing an engine, taking a swing at a golf ball or cycling down a hill. So why should there be any call for employee training on something so universally accepted? The answer lies in the causal chain that links error to injury. For the level of personal injury to fall in a company, you need more than just “take care” or “more attention, please”. People require tools that teach them how to stay alert and keep out of harm’s way – whatever the circumstances. SafeStart author, Larry Wilson, understands this need intimately, having spoken to some 40,000 employees across the widest possible spread of sectors and occupations. That experience taught him that almost all injuries stem, in whole or in part, from the actions of the person involved. 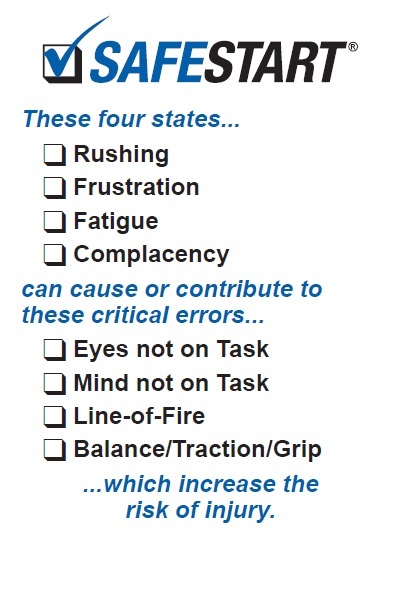 In addition, Larry Wilson discovered that almost all of these error-causing injuries were rooted in four states (rushing, frustration, fatigue and complacency) that opened the way to a quartet of critical errors (eyes not on task, mind not on task, line-of-fire and balance/traction/grip). Through raising awareness of this state-to-error risk pattern while using the SafeStart programme to minimise such errors, everyone, no matter their situation, is empowered to dramatically lower their risk of injury. Having spent a decade-and-a-half training, consulting and researching, Larry Wilson created SafeStart in 1998. In a nutshell, this comprehensive approach provides an advanced safety awareness training programme crafted to assist injury prevention in all kinds of real-world scenarios – at work, at home and on the road. SafeStart’s core mission is helping individuals to prevent unintended mistakes. Rather than looking to rulebooks, SOPs, PPE or defined hazards, our approach centres on the state of mind of the person undertaking a particular action and how that assists or impedes the keeping of hazards in mind and in sight. SafeStart furnishes you with an unmatched array of skills to keep yourself – and those around you – safe around the clock. SafeStart’s practical methods mean that people can now avoid what were once thought to be unavoidable injuries: those for which human factors are held to blame. For full effect, the programme is rolled out as a multi-year curriculum which is both thorough in application and demonstrated as effective in the field. SafeStart materials come in over 30 languages and have been implemented in more than 60 countries: 3,000 companies and counting around the globe are now enjoying the clear benefits of this revolutionary safety programme.